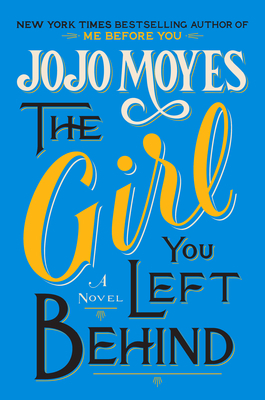 I already considered myself a big fan of Jojo Moyes; however, when Entertainment Weekly rated her latest novel THE GIRL YOU LEFT BEHIND an A-, I moved it right to the top of my TBR pile. I enjoy the occasional historical fiction read, and I'm always drawn to books with related stories that move between the present and the past. Needless to say, I had pretty high expectations for THE GIRL YOU LEFT BEHIND. And Ms. Moyes didn't disappoint -- I loved this novel (although it did take me awhile to really get into it) I don't know if I'd go so far as to say I liked it more than ME BEFORE YOU but that was a very special book -- you can read my review here. However, THE GIRL YOU LEFT BEHIND is an equally compelling story about a two women and a painting. THE GIRL YOU LEFT BEHIND begins in France in 1916 during World War I. Sophie's husband Edouard is a painter, but he's left his career and Sophie behind to fight for France in the war. Sophie is trying to keep her family's inn afloat during tough times, but then the Germans occupy their town and the inn too. Sophie has little of value now that the Germans have destroyed almost everything; however, she still has a portrait of herself that Edouard gave to her. This very same portrait manages to catch the attention of the Kommandant and he becomes obsessed with both the painting and Sophie. Sophie is desperate to see her husband again and willing to risk everything even if it means her life. Fast forward 100 years and Liv is now the owner of Sophie's painting. Her husband, who has since died, gave it to her; and she treasures it every bit as much as Sophie did. However, Liv's life is unexpectedly turned upside down when Liv discovers that this painting is extremely valuable and the original family wants it back. A battle over its history ensues, and Liv is forced to stand up for what she believes in and fight to retain the piece of art. I adored THE GIRL YOU LEFT BEHIND. Despite not exactly loving Sophie's story, I really enjoyed when the novel moved to Liv's story; and at that point, I couldn't put down the book. While I did find Sophie to be an interesting character -- I appreciated her passion and determination, I really felt for Liv and her battle to keep the painting. Like Sophie, she was extremely passionate and determined to do what she felt was right in honor of the man she loved. One thing I really liked about this book was how it made me think. Liv's story delved into a huge ethical dilemma, "Who was the rightful owner of the painting?" I honestly felt for both sides and I wasn't exactly sure how I felt about this issue. As the story progressed, things became much clearer to me, but for a big part of this novel, I just shook my head and thought that in some cases, there just isn't a "right" or easy answer. I mentioned earlier that Ms. Moyes didn't let me down with THE GIRL YOU LEFT BEHIND. I loved how she tied together Sophie's and Liv's stories, and I was really impressed with how she made the women so different and yet so similar. I found myself thinking about what these two women had in common -- missing their husbands, love for a painting that their husbands gave to them, risk taking, standing their ground, and much more; and I appreciated thinking about how the time period in which these women lived affected their outcomes. I truly did love these women's stories and how well Ms. Moyes transitioned between the two, but I also liked that this book had some mystery elements to it. What happened to Sophie was left up in the air at the end of her section, and I was also dying to know what really happened to the painting. Of course, the reader gets answers to these questions and more by the end of the book, but I appreciated how I was kept guessing for much of the story. It won't come as any surprise that I am recommending THE GIRL YOU LEFT BEHIND for book clubs. There is a reading guide with thirteen terrific questions. Most of the questions ask about decisions the characters made and what you thought of them, but there are also some themes you might want to explore including love, sacrifice, art, greed, rightful ownership, honestly, trust, and perseverance. Overall, THE GIRL YOU LEFT BEHIND was a fantastic book. Highly recommended! Giveaway alert: I have a copy of THE GIRL YOU LEFT BEHIND to share with one very lucky reader. To enter, just fill out the form below before Tuesday, September 24th at 11:59 p.m. EST. I will randomly select and notify the winner the following day. This contest is open to those of you with U.S. addresses only. Good luck! I've been hearing so many good things about this book - thanks for the giveaway! I'm so behind, I'm just now reading Me Before You. I will get to this one of these days! I hope to read this one soon. The ethical dilemma at the heart of the book is what drew me to it in the first place. Glad to see you really liked it. I loved Me Before You. I really want to read this one. I really had mixed feelings about this one. Good Lord...it took me nearly 2.5 weeks just to get through that first part about Sophia. I just couldn't engage! But then when we met up with Liv, it kicked into gear. I thought "now THIS is what I'm talking about". Ultimately, she pulled it off. It was a nice tie-in between the two women, but I came darned close to DNFing in that first hundred pages. I liked Me before You and so I've wanted to read this. THanks for the giveaway. She is going to be at the grand opening of the new Central library in Madison next week! !